Winter cutthroat - cold fish cold hands. Frozen, miserable, and weakly cursing, I was standing stock still, up to my navel in the wind and rain swept winter water of the slough. My fly rod was awkwardly rammed down into my chest waders and my icy, heat seeking paws were clamped tightly under my cooling armpits. I'd been in this miserable position for at least ten minutes, trying desperately to get some feeling back into my casting instruments so that I could resume fishing. I knew that if warmth and feeling returned, it would be short lived. Perhaps I'd get another ten casts off before I'd have to resume my former unhappy position. Cold numb hands are the enemy of the fly fisher who needs considerable finger dexterity and 'feel' to be able to cast and fish the fly effectively. And, fishing is supposed to be fun , not some damn survival contest with the elements. Winter may be the toughest time for hands and fingers, but in any season, conditions can arise that render these extremities sore and nearly useless. Some anglers (who must be descended from North Sea fisherman stock!) can fish bare- handed and happy in the worst conditions. For the rest of us, it's either quit for the day or try to convince our brain's temperature center that it's having a good time. Keeping hands and their fingers warm under adverse conditions is an on-going science. Since I'm one of the genetically inferior, I'm constantly looking for methods superior to the old arm pit trick. My chronically cold, numb fingers have led me on a long quest for the perfect solution for warmth and dexterity. Of course, perfection doesn't exist (the only true answer is to stay home and watch fishing videos). However, I've learned a few things to try that should go a long way toward making those cooler fishing excursions more bearable. It's a matter of priorities for the body's control center. If the main core (chest, trunk, thighs and head) isn't toasty, the poor old extremities won't have a chance. So the first step is to try to keep the core warm with layered, water-proof and wind proof gear that can be removed, opened or closed to regulate temperature as the environment of the moment dictates. Hands and fingers need to stay warm, but must maintain enough dexterity or 'feel' to be able to accomplish the tricky aspects of fly casting. Despite the weather, there are double hauls, line releases and retrieves, and reeling in of large, active fish that must be done. Hands equipped with big puffy mitts may be hot as chili, but they won't do a darn thing for the rod and line- handling dexterity. It's guaranteed frustration! However, with a little perseverance and practice, one can become skilled at performing the necessary rod and line activities with glove -encumbered hands. So, the two needs - warmth and 'feel'- are always in competition. A balance must be struck. 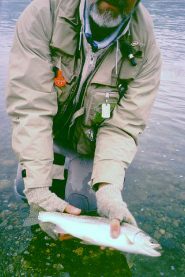 Fraser River winter - cutthroat search. If the core is warm but the hands are still in cold storage and stiff, it's on to stage two - the search for a glove system that will do the job for warmth and dexterity. Over the years I've tried just about every kind of glove/mitt, short of the ones with built-in battery operated heaters. Many of these gloves are made specifically for fishing. Finding the combo or system that works best for you will take some experimentation. Here's my opinion on what's available out there ( and remember on a scale of 1 to 10 - where 1 is frozen and 10 is hot - I'm near one. You'll probably be somewhere above this on the scale). Fingerless Gloves ( wool, synthetic, rubber, fleece or some combination) - in these, the pinky ends are exposed to the world. Their goal is to provide a measure of warmth while maintaining the all important 'feel'. There is also a hybrid of this glove that incorporates a permanently attached mitt portion that can be pulled over the fingers ( extra warmth traded for decreased dexterity). These gloves aren't bad when the conditions are less extreme and they do provide good dexterity. However, they frequently wet through, and that's when the cold really comes. When wet, my stiff fingers have difficulty peeling them off them in order to seek out some outside heat source. Neoprene Gloves ( thin diver-suit foam rubber ) Newer more expensive ones have a permanently bonded very light "fleece-like" lining. Some are intact gloves, while others have finger slits so that key fingers ( like the thumb and forefinger) can be exposed. Intact gloves are mostly waterproof while the slitted ones are not. The best ones are designed with a "relaxed" or curved finger profile. These gloves are certainly worth looking into. They are fair for warmth, and good for dexterity. However, they don't "breathe" the way fabric gloves do, so there will be condensation that creates clammy, cold, interior conditions. I prefer the complete, intact gloves that are waterproof. These can be immersed in water without leakage ( good for releasing fish). Avoid overly tight neoprenes. They will cool the fingers faster and be tiring, as the fingers constantly have to flex against the springy rubber. A downside is the difficulty of getting these gloves on and off when they are damp inside ( another reason to avoid the tight ones). Waterproof "Ski" Gloves ( can be the standard 5-fingered version or the rarer 3- fingered "semi-mitt".Good ones have the "relaxed" fingers ). I really like these gloves, because they are good for us "cool handers". They potentially provide more warmth because they have more insulation.It's important to find ones that aren't bulky on the palm side of the hand so they don't lose dexterity. Look for models that have a wide, open cuff. Avoid the close-fitting knitted cuff styles because these will drive you crazy trying to get them on and off under cold and wet, "sticky" conditions. 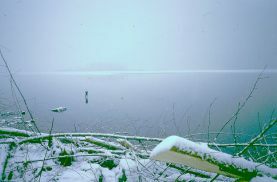 Late November - after coho salmon. Water-proof is really important. True water-proofing in this type of glove can be very hard to find, as it requires a breathable, water- proof liner ( often Gore-tex ) that is not sewn through when the glove is made. Many gloves will claim to be water-proof, yet leak like sieves because they have a million sewn-through seams (the fabric may be water-proof, but the seams are not). Ask lots of questions, and buy these gloves when they are deeply discounted since they can be expensive. The 3-fingered style has the warmth advantage of keeping groups of fingers together, while the split palm still provides for reasonable dexterity. 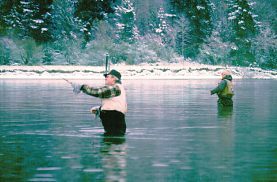 Many brands and models of neoprene chest waders are made with a special handwarmer "pocket" on the front, at the level of the angler's lower chest or gut. This pocket lies flat against the body and therefore picks up body warmth. This really helps to warm chilled hands. This is a very useful wader option, and contributes to the pinkie protection plan. There is no 100%, "warm -all -the -time" glove system. For really extreme conditions, or very sensitive fingers, outside heat sources are the best. These can very quickly tune-up the digits for a few more casts. I've tried all manner of easy to carry heat generating devices. For years I carefully went through the tedious rituals associated with lighter fluid and charcoal stick hand warmers. They worked well enough, but were difficult to light in the field, and were better lit indoors, in anticipation of the conditions. They also stank like a refinery or an old fire. Hand warmer evolution produced a non-disposable, chemical reaction warmer that I tried and very quickly rejected. These were expensive to purchase, heavy and bulky, short-livedfor heating and too easily activated by accident. They also required a fiddly process of boiling in hot water to return the dead warmer back to an active state. I've since discovered the magic of disposable hand warmers. They come in a flat sealed plastic packet and are sold in most outdoor stores in winter. They are available in two sizes: a larger "pocket" warmer size or a smaller size that will fit inside a glove ( sold 2/pack). The beauty of these is that they can be carried in a fishing vest or bag, and only need be activated if the conditions warrant. They are easily started by ripping open the packet, removing the inside pouch, and then massaging it's guts. When exposed to air, the simple vermiculite, salt, and iron filing ingredients engage in a heat producing odorless reaction that will keep a pocket warm for up to eight hours. The best environment for keeping these warmers operating at peak heat-producing efficiency is a loose,dry pocket. Down or fleece vests or jackets usually have front or side pockets that are ideal. A warmer in each pocket of the garment ( which is worn inside the chest waders ) is very easily reached by cold hands. These warmers do not like to get damp, so wet glove removal prior to gripping the warmer is a must. The system I find best is a combination of the previous items discussed. The disposable warmers are the central ingredient, and without these I'd be lost. I use the warmers for a heat source, combined with any of the glove types. I'll often use a different glove type on the rod hand ( ie. bulkier and warmer, since less dexterity is required) and on the line hand ( ie fingerless or neoprene, with full or split fingers, since more dexterity is needed). The line hand will likely cool faster, requiring more dips into the hand warmer pocket. When I remove gloves to access the heat sources I'll stick the gloves in a warmer place (down my waders, or in the wader hand warmer pocket). This keeps the gloves pre-warmed, avoiding a frigid environment for the semi-warmed hands. So - There should no longer be any excuses for avoiding casting and fishing because the hands are frigid whimps, unless you really do prefer to video fish in the warmth of a home fire with some fine tasting beverage that possesses anti-freeze properties!